During the long drives on our recent holiday, we entertained ourselves in various ways. Music from various CDs, a few episodes of Astronomy Cast on another CD, and a game or two of The Art Of Conversation. That last item gives me an idea for a blog post. 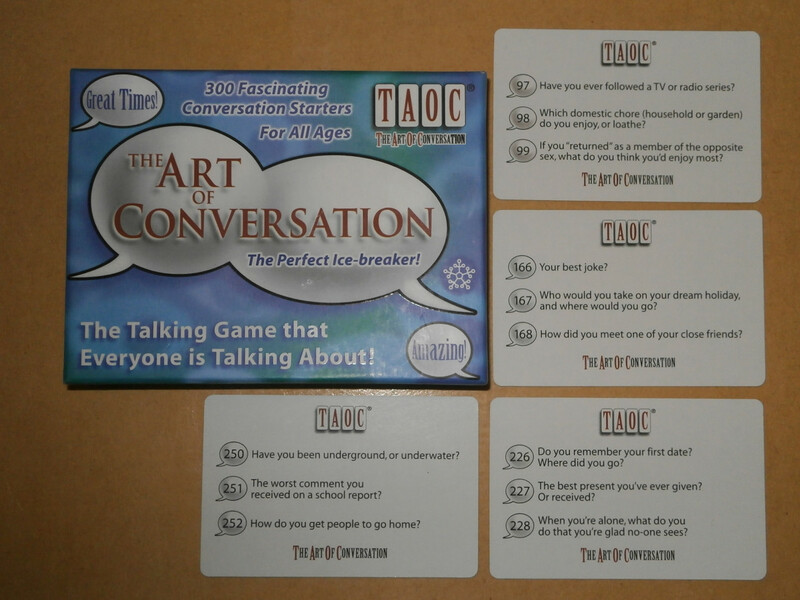 The Art of Conversation consists of a hundred cards that, between them, contain 300 conversation ideas (yeah, you’re all thinking Monty Python did it first in Meaning of Life, but this is genuine). To play, you leaf through the cards until you find a question you want to ask, then everyone else answers that question, and then it’s the next player’s turn. Concepts of winning, losing, and competing do not exist in any form. Below is a photograph of four cards from the game. [Update 2014: I’ve taken a new photograph to replace the out-of-focus original.] Underneath I’ll blog in the spirit of the game, by selecting topics from these cards and writing either about that or about something closely related. 250: Have you ever been underground, or underwater? Of course: I’ve been in several caves — both the crawly kind and the walky kind — and I had to submerge myself in water to pass swimming lessons as a child. That much is trivial, but I’m reminded of a story. I am not a water person, and it took me a particularly long time to be able to open my eyes under the water. I eventually succeeded with the following technique, which may be useful to others. (1) Close your eyes, submerge your face, lift your head, count to ten, and open your eyes. (2) As above, but count to nine instead of ten. (3) Keep repeating, each time reducing the count between lifting your head and opening your eyes. (4) On the eleventh go, close your eyes, submerge your face, lift your head and open your eyes immediately. (5) Now that your eyes are temporarily accustomed to small drops of water, submerge your face and open your eyes underwater. (6) Enjoy the satisfaction of a mission accomplished, and hope it compensates for having itchy eyes for the rest of the day. 228: When you’re alone, what do you do that you’re glad no-one sees? Engage in expressive contemplation of topics related to question 99, of course. Duh. Q: What do you call a short song?